Charter CEO earns nearly ten times what low-wage paraprofessionals earn, while CICS-controlled management operations cry poor as top bosses hoards tens of millions in public dollars for insider investments and management ‘fees’. See full livestream of press conference at this link. CHICAGO—In a shocking disclosure late last year, charter school operator CICS—Chicago International Charter Schools—admitted to CTU members that management is siphoning off close to 30% of the public education dollars they receive at some schools, while some staff earn barely $30,000 per year and classrooms are desperately short of resources. CTU members have also learned that management is hoarding more than $35 million in cash, pumping it into an increasingly bloated management bureaucracy and shoveling close to $20 million into investment funds controlled by a former treasurer and president of CICS’ foundation. CTU educators at four charter schools under the authority of CICS have been bargaining for a new contract with management since last May. But that bargaining has stalled around demands for more classroom resources, smaller class sizes, adequate staffing of counselors and social workers, and better compensation for low-wage teaching assistants and other critical frontline staff. CTU educators voted overwhelmingly in November to authorize a strike against CICS at four unionized CICS schools: high schools Ellison, Northtown and Chicago Quest, and elementary school Wrightwood. The schools together serve a population of overwhelmingly low-income Black students, with high percentages of low-wage Black paraprofessionals and teachers, as well. 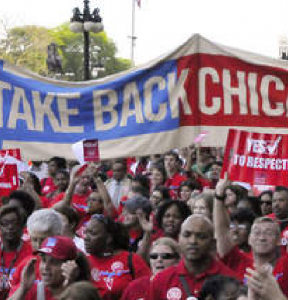 Today CTU educators set that strike date—for February 5. CICS has the funds: the charter operator has hoarded more than $36 million in public dollars into ‘reserves’. $19 million of that cash is “invested” with CW Henderson—a company founded and led by Craig Henderson, one-time president and treasurer of CICS’ Chicago Charter School Foundation. Henderson told Crains three years ago ‘the municipal bond market is clamoring for more charter school bonds’ as part of his pitch for charters to solicit more public funding to invest in the bond market. CICS’ CEO Elizabeth Shaw earns over $230,000 per year to run a network of 14 schools—nearly as much as CPS CEO Janice Jackson, who runs a system with more than 500 schools. CICS’ for-profit charter management organizations, or CMOs, continue to claim they have no funds to provide for more classroom resources or living wages for workers—because CICS has those funds, not the CMOs. Some paraprofessionals earn barely $30,000 per year, and ‘raises’ for some teachers in the last two years topped out at 3.75%—below the inflation rate—with some frontline staff seeing even lower—or no—raises. Frontline workers receive no annual cost of living increase. Last year’s new funding formula for charters was a boon for CICS management—but not for classrooms or students. CPS funding to CICS increased from $82 million in 2017 to to $93 million in 2018, an increase of 13%. The schools’ total revenue increased 9% in 2018. But across the whole organization, spending on program services increased a paltry 3% in that same period, while spending in the “management and general” category increased by 31%. At CICS’ central office, expenditures on management salaries and consultants increased by 80%. For the four CICS schools that the CTU has unionized, expenditures on program services increased even less, at a miniscule 2%—while the operator increased expenditures on management costs by 35%. For the 2019 school year, management fees got another bump, increasing by a total of 18% over 2018 costs. Since 2017, across the four CTU-organized schools, management fees are taking an additional $2 million out of the classrooms—a 44% increase since 2017 alone. CICS is notorious for spinning off for-profit charter management organizations, or CMOs, to run their schools. While CICS essentially owns and has oversight of their for-profit CMOs, those management organizations have cried poor with CTU members as top brass hoards public dollars or sinks those funds into increasingly bloated top management staff salaries. For example, in recent years, CICS has created a series of six-figure ‘educator entrepreneurs in residence’ positions, collectively spending over $360,000 on those non-academic positions in 2018 alone. CICS has repeatedly stated it traditionally does not engage in broad fundraising to provide programs and resources for their campuses—saying they believe educators should learn to do ‘more with less’—yet they’ve set aside half a million dollars in grant funding to expand those ‘entrepreneur’ fellowships, whose work includes efforts to expand CICS’ CMO reach in the charter industry. The CTU staged the first charter strike in U.S. history in December, targeting charter operator UNO/Acero. 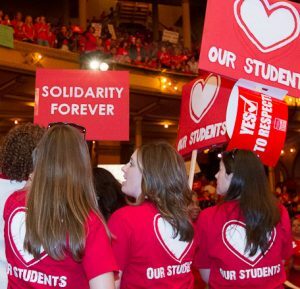 That strike forced management to agree to enforceable class size reductions and management penalties for class size violations; management compliance with special ed laws and mandates; and equal pay for equal work with CPS educators, who teach the same students as those in charters at better compensation rates. Those demands parallel the CTU demands to management at CICS schools, where pay is low and classrooms are chronically under-resourced. Pro-privatization heirs to the Walmart fortune have pumped hundreds of thousands of dollars in recent months into the political coffers of INCS—the Illinois Network of Charter Schools—to support political candidates who back INCS’ increasingly unpopular privatization agenda.